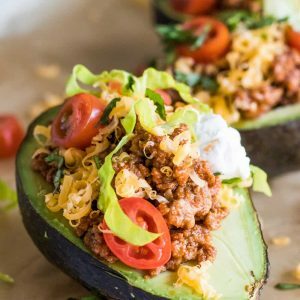 Taco Stuffed Avocados. A healthy twist on tacos! Load up all your favorite taco toppings into an avocado half for an easy lunch or light dinner. Hey everyone! It’s Serene from House of Yumm. Today I’m bringing you one of my favorite meals. Tacos! Except I added a little twist to these tacos and stuffed them into an avocado. This makes this dish perfect for a lunch, or even a light dinner. Best of all, my kids absolutely love this meal. 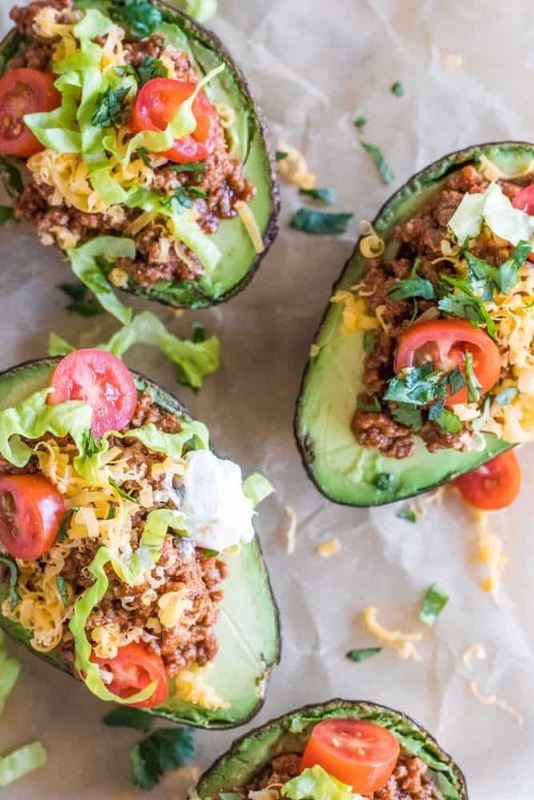 I’m pretty sure these taco stuffed avocados are going to be a regular on our meal plan from now on. It comes together super quick and easy too. Of course, it’s completely customizable. Although I highly recommend that you use my recipe for homemade taco seasoning and follow the instructions on how to make the best taco meat possible! You can of course use any meat you prefer for the stuffed avocados, maybe some Slow Cooker Mexican Brisket, or Slow Cooker Carnitas. Then load up with your favorite toppings. Cheese of course, some tomatoes, lettuce, cilantro and sour cream are my go tos. 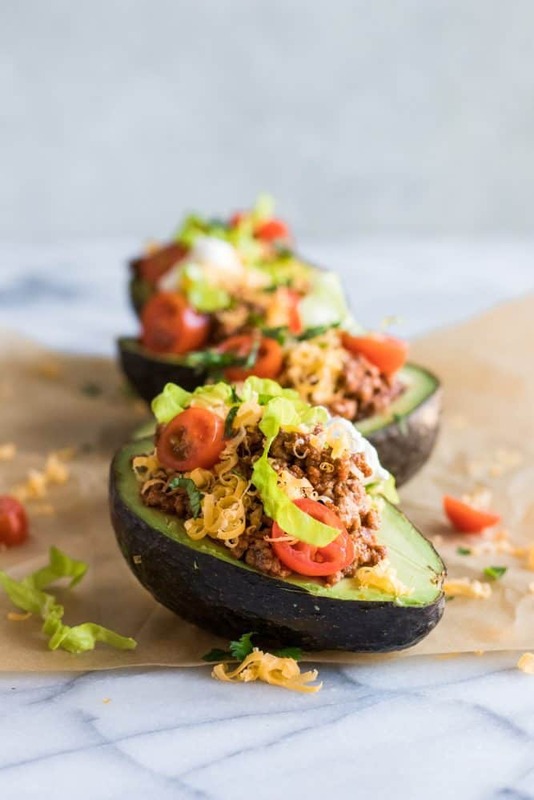 One of the best parts of doing these taco stuffed avocados is that you can scoop some of the avocado out before adding the toppings and use that to make some guacamole. I made this for the first time today, and it was very good! 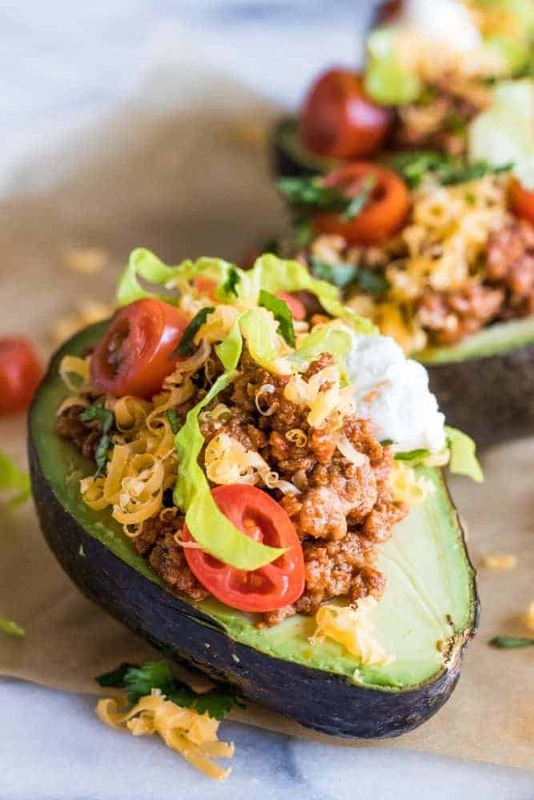 The only suggestion I would make, and some thing I will try next time, is to scoop the avocado “meat” out and mash it up, then put it back in the shell, with the fixings on top. That would make it easier to eat. Great idea! We scooped the entire inside out smeared half back in then topped. Much easier to eat. I also tried slicing in 8ths without taking much out. Either way. FANTASTIC fun recipe! Any nutritional values available for this recipe? It looks good but I also have to watch my fat & calorie intake as well as carbs. 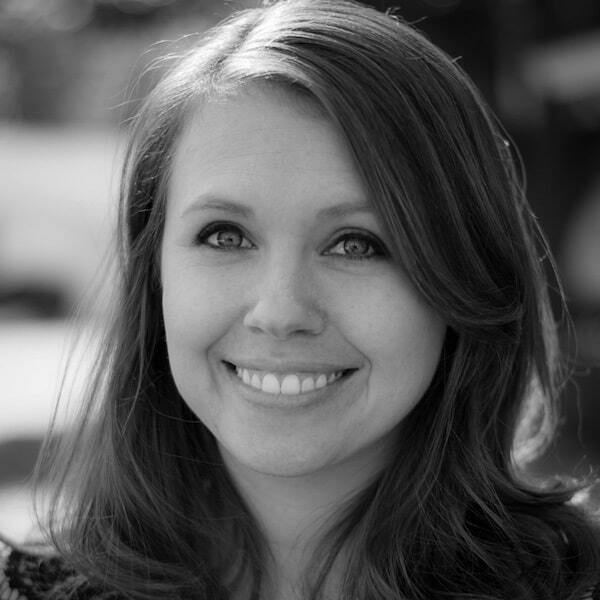 I’m diabetic and always looking for good, low-fat, low-calorie, & low-carb recipes. I am really tired of cooking the same boring stuff. I want to learn how to cook all these foods that u have in these pictures with the recipes. How many net carbs ?? ?